We also provide Audio for Listening Sections. The Following is TOEFL PRACTICE TEST that focuses on STRUCTURE QUESTION ONLY. TOEFL PRACTICE TEST BOOK. DOWNLOAD HERE. You can use it for practicing TOEFL TEST. 2. Comets are relatively small celestial bodies ______ up chiefly of dirt and icy materials. 3. Researchers have long debated about _____ moon Titan contains hydrocarbon oceans or lakes. Complete EXERCISE and Answer Key, CLICK HERE. 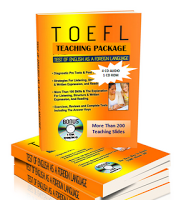 Beberapa TOEFL CD ROM yng wajib anda miliki sebagai materi tambahan latihan persiapan menghadapi TES TOEFL.